A generous donation from the Southwest Medical Center Auxiliary is helping newborns sleep more soundly during their hospital stay through the use of “sleep sack” swaddle wraps. Volunteers provided for the purchase of a full laundry rotation of Halo SleepSack Swaddle wraps, which are designed to promote safe sleeping as well as greater comfort for newborns. 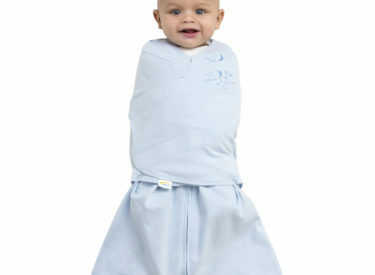 The swaddle wraps are a zip-up “sack” which allows babies hips and legs to move freely. Infants’ arms are then tucked into the swaddle’s wings and secured to help reduce startle reflexes which can keep them awake throughout the night. Each swaddle wrap has a “back is best” reminder embroidered on the chest to encourage safe sleep practices. Newborns at Southwest Medical Center are placed in these swaddle wraps during their stay at the hospital, and the SWMC Auxiliary Gift Shop has additional Halo SleepSack Swaddles for sale. Southwest Medical Center’s OB Nurse Manager, Tammie Thompson, RN, notes that the easy-to-use swaddles bring great peace of mind to new parents. Southwest Medical Center’s Vice-President of Patient Care Services, Robin Allaman, RN, said she is thankful for the Auxiliary volunteers’ contribution to patient safety. The Southwest Medical Center Auxiliary Gift Shop is located inside the main entrance of Southwest Medical Center. Volunteers offer gifts, jewelry, home decor, apparel, snacks, and many more items for sale, with 100 percent of proceeds benefiting special patient care item purchases. The Southwest Medical Center Auxiliary welcomes new members of all ages to join. If you are interested in becoming a member, please contact the SWMC Auxiliary Gift Shop at (620) 629-6899.